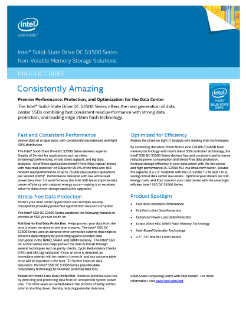 The Intel® Solid-State Drive DC S3500 Series offers the next generation of data center SSDs combining fast consistent read performance with strong data protection, and leading edge 20nm Flash technology. Deliver data at a rapid pace, with consistently low latencies and tight IOPS distribution. The Intel® Solid-State Drive DC S3500 Series delivers superior ...quality of service for applications such as video streaming and conferencing, virtual client support, and big data analytics. All of these applications benefit from 50µs typical latency with max read latencies of 500µs for 99.9 percent of the time and 4KB random read performance of up to 75,000 input/output operations per second (IOPS). Performance delivered with low active read power (less than 1.3 watts) means this Intel® SSD helps improve data center efficiency with reduced energy costs—making it an excellent value for data center storage application upgrades!